Getting enough protein can be a challenge if you're vegetarian, vegan or just not a fan of dairy, eggs, fish or meat. Protein is necessary for building muscle, repairing muscle tissue, creating strong hair and nails and helping move oxygen throughout your bloodstream. Lack of protein can make you weak, can contribute to heart disease and failure of your respiratory system and can compromise your immune system. Fortunately, getting complete proteins from plant sources such as red lentils is pretty simple. Lentils do contain all nine essential amino acids, though their low levels of methionine means that they don't offer a complete protein on their own. There are 21 basic amino acids that your body needs in order to function. They come in several different shapes and can combine in tens of thousands of different configurations to make up proteins. This is why amino acids are called the building blocks of protein. Nine of these amino acids can't be manufactured naturally and must be provided through the foods you eat. The nine amino acids your body can't create are are histidine, isoleucine, leucine, lysine, methionine, phenylalanine, threonine, tryptophan and valine. Each has a slightly different function, but all nine are needed in order to form complete proteins. Proteins are an integral part of your body. Animal proteins such as those found in eggs, dairy, fish and meat are complete, but they also bring unwanted elements such as cholesterol and saturated fats. Red lentils are a good source of protein without any of the drawbacks of animal proteins. Read more: What is the Function of Amino Acids in the Human Body? The amino acids in legumes are generally not all present in high enough quantities to provide a complete protein. For example, red lentils are low in methionine. Once methionine is metabolized, your body can't access the other eight amino acids in your serving of lentils. That means you aren't getting a complete protein. Since they're not a complete protein, it's best to pair lentils with a whole grain such as brown rice or quinoa, which provides the missing methionine. Alternatively, you can make sure you eat a whole grain within the same 24 hours. Good news is that preparing red lentils isn't difficult. Just remember to sort through your red lentils, removing any that appear shriveled or too dried, and gently simmer them for 15 to 20 minutes. They don't need to be pre-soaked, and their slightly sweet, nutty flavor pairs well with a whole range of spices from simple and savory rosemary and thyme to the delicate sophistication of curry and turmeric. Another way to make sure that you get all nine amino acids from your lentils is to sprout them. This increases the levels of all nine amino acids, giving lentils complete protein. Simply soak your lentils in cool water for eight to 12 hours. Rinse and store them in an airtight container for a few days, rinsing them every eight hours until you can see the sprouts. Sprouted lentils cook faster, so simmering them for eight minutes or so should be enough to tenderize them. 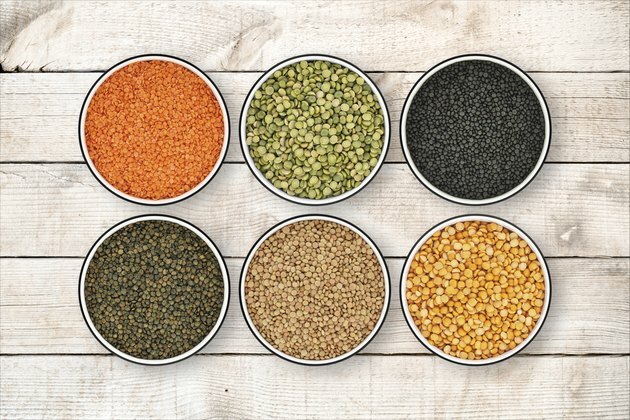 Cooking Light: Not All Lentils Are Created Equal — Which Variety Is Right for You?